K's Kraftology: Let it shine! 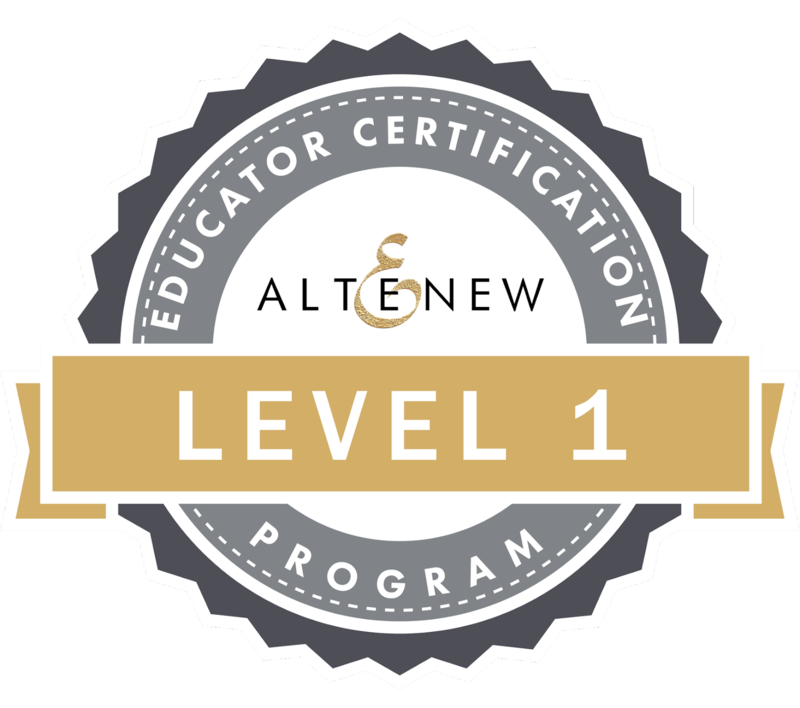 I took a break from my Altenew Educator Certification Program classes so I could keep up with the holidays. Now that the big one is over, I'm back at it! The class I did this time is called Let It Shine. It's all about ways to add shine, glitter and glitz without having to use a lot. 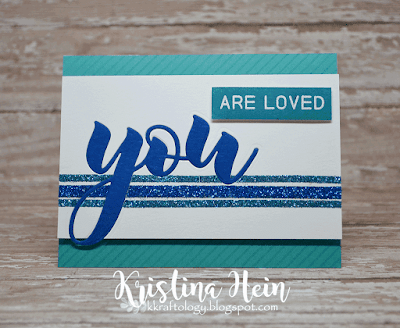 The instructor had lots of great tips using everything from enamel dots to mirror cardstock. In fact, she had so many awesome ideas that I had a hard time choosing which one I wanted to focus on! I actually started two different cards but finally picked one. The other one I have turned into a birthday card for my son. I started with a an A2 sized piece of white Neenah 110lb paper. Near the bottom of the paper I placed a piece of 1/4" Scor-Tape. I then placed a strip of 1/8" Scor-Tape above and below it. Next I picked out a blue and teal glitter from my stash. I carefully peeled up the 1/4" tape backing to reveal the sticky side. I sprinkled the glitter over the strip, dumped off the extra and burnished it with my finger. Yep, I totally got my glitter on today! I cleaned my craft mat using a piece of a dry swiffer cloth to pick up the glitter. 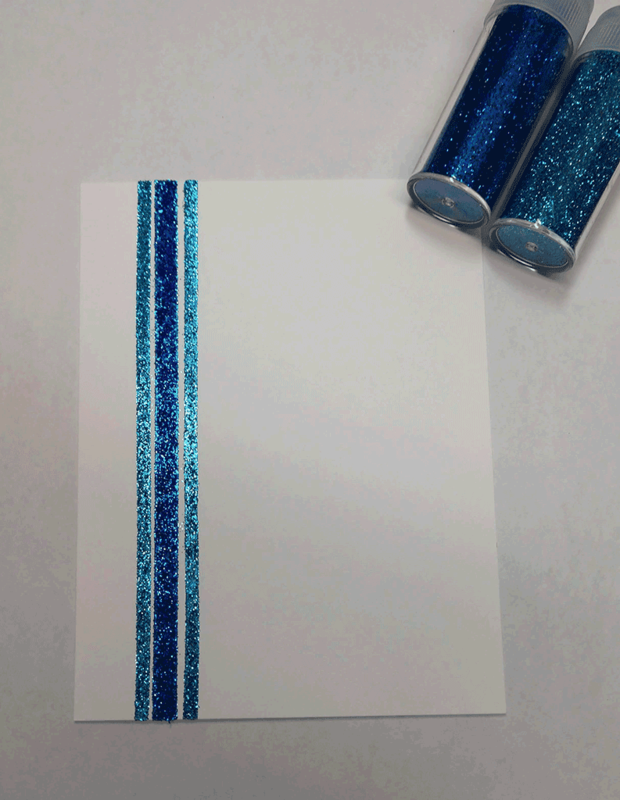 Then I repeated the process with the 1/8" strips and the teal glitter. Check out all that shimmer!! On to phase two! I had already picked out the stamp and die set that I wanted to use. Mega Greetings 2 and the Mega You die. 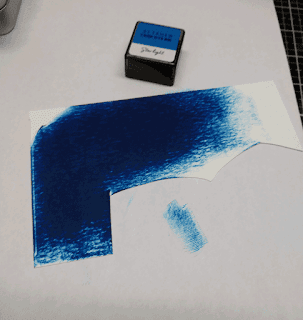 I took a scrap piece of white cardstock and rubbed the Starlight Blue ink pad all over it. It was the closest Altenew blue ink to the blue glitter that I used. I went over the paper a couple of times until I got complete saturation. I did dry it with my heat tool because I used quite a lot of ink! I took the paper and the You die to my die cutter and ran it through. Now, I also took my glitter piece and ran it through the die cutter as well. Making sure to keep all the inner pieces. I then took the blue You and inlaid it into the glitter piece. I popped the inner part of the Y and the O bits back in from the glitter piece. As you can see in the picture above, I cut about an 1" and a 1/2 off of the white glitter piece. Now on to the card base. I cut white cardstock to an A2 horizontal, top fold card base. 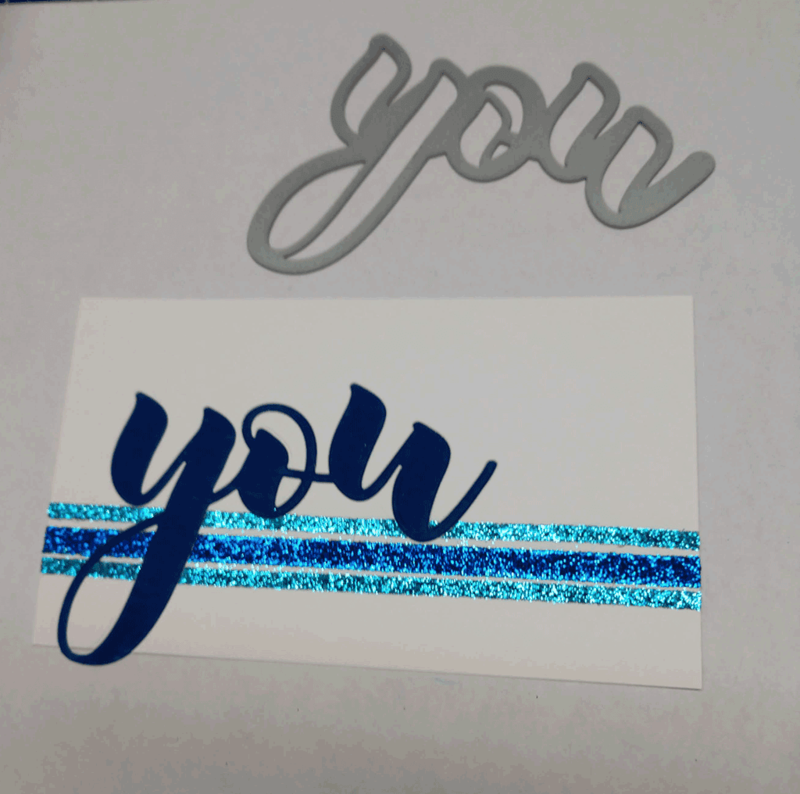 I took a piece of teal cardstock from my stash and cut it to A2 as well. Then I used Versamark ink to stamp a pinstripe pattern on the teal piece. I thought it looked a little plain but I didn't want anything too distracting. I did give it a quick dry with my heat tool since Versamark stays wet longer than dye inks. I glued this directly onto the card base. Next I applied a liberal amount of foam tape to the back of the glitter piece and adhered it in the center of the card base. Almost done! 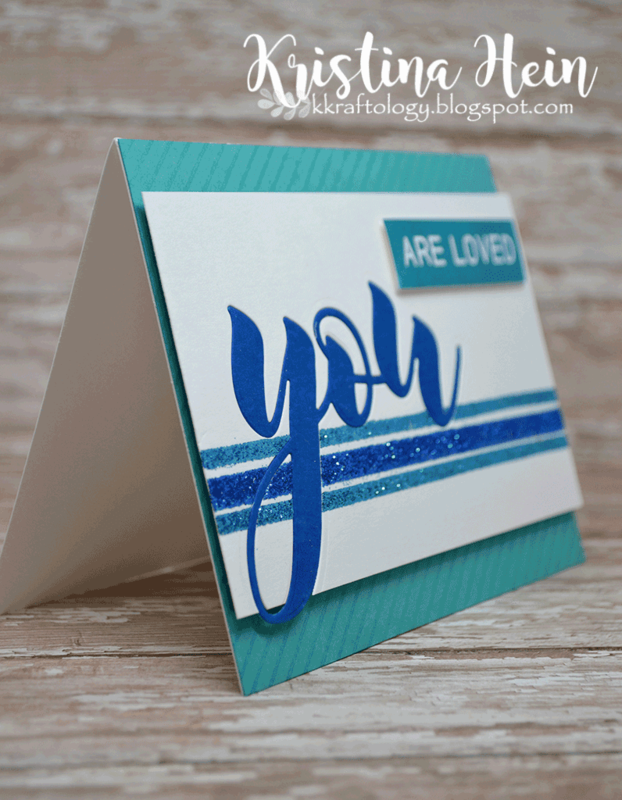 I did want to add the stamped sentiment "are loved" to the card as well. I took another scrap piece of white paper and rubbed Teal Cave ink on it. Once it was throughly covered, I dried it with my heat tool. I went over it with anti-static powder and stamped it in Versamark ink. 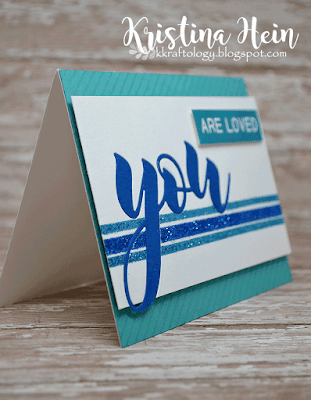 Then I sprinkled on white embossing powder and melted it with my heat tool. I cut it down to a rectangle and played around to find just the right placement. Once I figured it out, I added foam tape to the back and adhered it in place. I thought about adding a few embellishments but I think the glitter strip adds enough glitter and glitz! I hope that comes through in the photos!! This CAS design may seem simple yet it is full of thoughts and yet is well-designed throughout! Love the touch of glitter and use of dimensions! I am so glad that you enter your beautiful work in Altenew AECP assignment Gallery. Awesome details and design! Super work!